Home Confetti: New CB2 Novogratz Collection and Enter to Win a Trip To Their Brazil Home! New CB2 Novogratz Collection and Enter to Win a Trip To Their Brazil Home! This is a Sponsored post written by me on behalf of CB2. All opinions are 100% mine. I fell in love with the dynamic design duo Robert and Cortney Novogratz when I saw their show on HGTV. Their ability to create a funky, totally unique space with a down-to-earth demeanor is so inspiring to me! Their designs are playful and always unpredictable. That's why I am super excited to see what they've come up with for their CB2 and Novogratz Collection at Crate and Barrel. Luckily, we won't have to wait too long. The collection debuts May 2nd, and was inspired by their vacation home in Brazil. Sounds perfect for the upcoming warm weather. Best of all, CB2 has made getting the Novogratz look afforable. I have been loving the neon trend, and they've incorporated neon into their collection. Doesn't their Rouge Coffee Table just give the outdoor patio a great pop of color?! 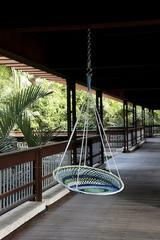 And how comfy does that Figueira Swing Chair look? I bet you'll feel like you're on vacation sitting in that! Enter to Win the CB2 and Novogratz Brazil Getaway! Enter at cb2.com/sweeps starting May 2nd! Wouldn't you love to see first-hand what the Novogratz home in Brazil looks like?! Enter to win the CB2 and Novogratz Brasil Sweepstakes. You and three friends could win a one-week stay at their vacation home in beautiful Trancoso, Brazil! Soak up their design aesthetic as well as the sun! 10 other lucky winners will receive a CB2 giftcard with $100 along with a personally signed copy of the book "Home by Novogratz." You can enter starting May 2, 2013 through June 3, 2013. Good luck! To keep up with all the newest CB2 collections, visit CB2 on Facebook, Pinterest or @CB2Tweets on Twitter.